For its first 10 episodes, SGU focused more on building its characters than quickly pushing the story forward. New developments occurred on the Destiny, but they arrived with a slower pace than many fans expected. A dramatic shift happened with “Space”, which introduced new enemies and built on the rift between the civilians and the military. In a certain way, it almost packed too much into a single episode. By the end, Rush was already back on the Destiny after being stranded by Young in “Justice”. Chloe was captured and then quickly saved, though her time on the ship will make quite an impact in the future. The forward movement is even more significant in “Divided”, which concludes the two-part conflict with the aliens. What makes this story click is the way it combines that battle with an attempted coup led by Wray and Rush. In fact, a majority of this episode only hints at the aliens’ return. Chloe and Rush are having nightmares about their experiences, but we don’t have all the information. He knows there’s a tracking device inside his chest that will bring danger to the Destiny. Robert Carlyle brilliantly underplays the fear that’s driving Rush to pursue the mutiny. Unlike Wray, he doesn’t care about larger issues of civilian versus military authority. Rush needs control so he can prevent Young from sacrificing him to save the others. 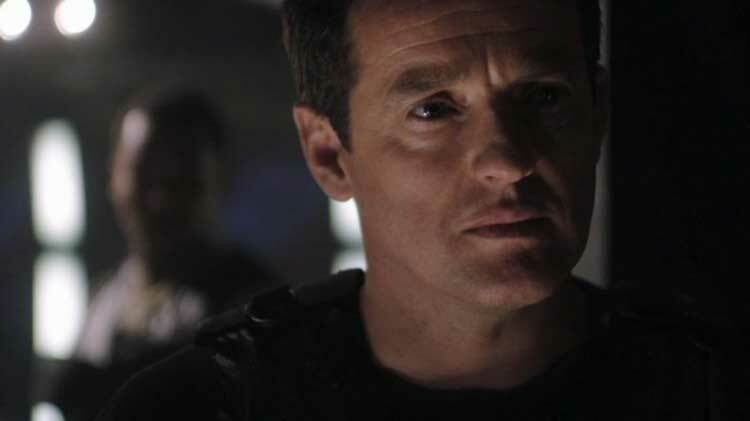 Young was willing to fire on the alien ship with Rush and Chloe on board in the last conflict. He’d likely do the same again. 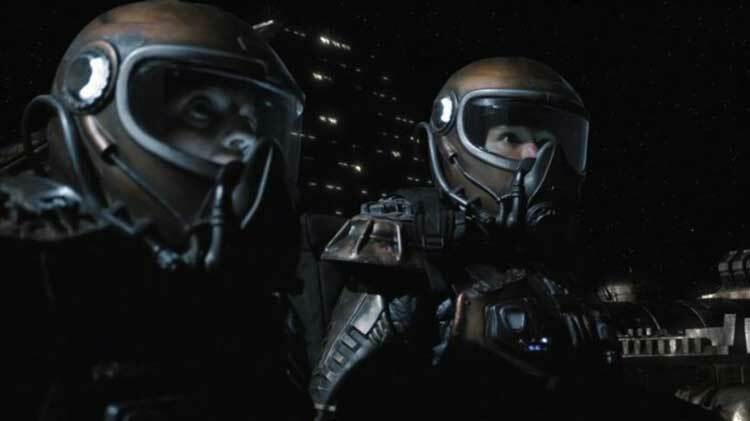 “Divided” has similarities to the Battlestar Galactica season four episodes “The Oath” and “Blood on the Scales”, which also included a mutiny attempt. There’s a quite a difference in the shows’ approaches, however. Both sides on SGU aren’t looking to harm the others unless it’s absolutely necessary. If Young wanted an excuse to take out Rush, this would be a perfect one. Instead, he doesn’t punish the civilians after the coup is thwarted. The rift on BSG is much greater and leads to deaths and serious injuries. Zarek and Gaeta are playing for larger stakes and willing to do anything to succeed. They end up facing the firing squad, but the ramifications of their actions remain. It’s a brutal way to show how far the characters have fallen. Wray’s attempts on SGU feel more naïve and don’t recognize her opponents’ abilities. Young is a trained military commander, so it’s only a matter of time before he regains control. What makes this coup more than a total failure is the way it brings simmering issues out into the open. The scientists and other civilians aren’t used to taking orders from the military about every move. It also puts characters like Chloe on a different side than you might expect. They’re essentially building a new society on the Destiny, and there’s no single approach that will work for everyone. The writers are on Young’s side, but we can understand Wray’s point of view. The episode begins with Chloe experiencing a lucid nightmare reliving her experiences with the aliens. It’s quite a creepy scene and says plenty about her mental state following the abduction. The Brand New song “You Won’t Know” plays during the dream and syncs well to the powerful start. The highlight is Chloe looking through a door and seeing herself being captured by the aliens. The convincing look of terror on Elyse Levesque’s face totally sells the moment. The others can’t understand what Chloe and Rush went through on that ship. She’ll never be the same and isn’t the innocent who once seemed unfit for the challenges they face. An intriguing part of this sequence is the robotic way that Chloe strolls through the ship. It foretells the transformation that’s coming, especially in season two. After she wakes, Chloe’s walk to meet Rush in the mess hall closely matches the dream. Her nightmares are more than post-traumatic stress after a horrific experience. Chloe is already different, and her subconscious mind is providing hints about that change. She’s also now linked to Rush, which will impact the mutiny. Her boyfriend may be in the military, but that doesn’t mean Chloe will just follow her friends without question. Rush also has a new approach, but he seems less confident following his capture. The conflict with Young has made him less brash. Rush also appears hesitant about the mutiny despite his need to gain control and beef up the shields. Part of him recognizes that the coup won’t work, and it’s more of a stalling tactic to avoid the aliens. Rush still goes through with taking over the ship, but he isn’t the same guy who yelled “we’ll never be done!” at Young while spitting out blood. He’s more pragmatic and isn’t sure about the best way to navigate the Destiny following his brawl with Young. He can’t just be the loner who’s working for his own ends. Another thrilling part of this episode is having so many characters directly involved. It’s difficult to fit the large cast into most episodes, but it feels natural this time given the high stakes. Volker and Brodie are becoming quite a dynamic duo, and their failed efforts to escape TJ in hydroponics add a lighter touch. Alaina Huffman also gets a chance to do more than care for injured patients as TJ. The biting and determined way she clarifies the situation for the unprepared civilians is perfect. They’ve turned the conflict into war, and that’s the soldiers’ turf. There’s also a fun moment for Greer after he knocks out a few guards. He went easy on them. Eli’s role as a civilian who trusts the military puts him right in the middle of the conflict. He believes in Young despite suspecting that he stranded Rush on purpose. There’s also an interesting moment where Eli believes (perhaps accurately) that Chloe distracted him to help Rush. His romantic feelings aside, their friendship has been one of the stronger bonds on the ship. Eli also has an interesting relationship with Rush, who admires his intelligence. They can work together well, but their perspectives on what’s right are quite different. For example, Eli knows that Young and Greer need more time to get back on the ship before he escalates the shields. He’s forced into stalling to make sure they survive (and can end the coup). He still believes that Young deserves to lead and doesn’t want to grab control. What rings true about the split is the uncertainty from both sides on how far they’ll go. The military could shut down life support, but the civilians have the food and water. Scott’s comment that “we still have to live with these people” clarifies the stakes in play. He believes that Young should be their leader, but that doesn’t mean they should be ruthless. Hanging over his statement is the knowledge that Chloe is on the other side. Their relationship has been idyllic so far, but cracks are starting to appear as circumstances grow more challenging. One stunning moment underscores the ambiguity in Young’s feelings towards the mutiny. When he points a gun at Rush, the look in his eyes says that Young is ready to kill him. Shooting Rush would save the Destiny from the attacking aliens but forever divide the group. Louis Ferreira’s intense presence leads us to believe that Young could do anything, and there’s a simmering anger behind his calm demeanor. However, Young’s already facing serious guilt about leaving Rush on the planet. His recognition that even Rush is worth saving shows his evolution. He’s flawed and makes mistakes, but he still seems most equipped to face the enemies to come. There’s so much happening with the power struggle that it’s easy to forget the excitement in the final act. In a nice callback to SG-1’s “Lockdown”, Dr. Brightman (Alisen Down) joins the ship through the communication stones to operate on Rush. Her surprise at being part of an alien attack (and Scott’s amazing laid-back explanation) adds much-needed brevity to the tension. There’s also a subtle callback to the venom from “Time” being used as an anesthetic. If performing surgery while being shelled wasn’t enough, losing the connection raises the stakes. This moment gives TJ and Chloe the chance to step up and save the day. The well-executed climax again reveals the importance of the early slow-burn approach. We understand Eli, Scott, and the other characters, so their actions feel natural when threats emerge. When Young tells Wray that he’s “open to suggestions”, it’s true but doesn’t mean the road ahead is easy. To soldiers like Greer, the coup has proven why they need military control. Wray may feel like she’s won a victory by getting Young to admit he shouldn’t have left Rush. However, she’s also made sure that few will trust her or Rush anytime in the near future. One of the brilliant things about this show is how they writers left many things up to the interpretation of the audience: You don't always get to explore the inside of a character's brain. A perfect example of this is "Justice" where what was going on in Young's head when he went through the Stargate to the planet is never fully explored. Just as important, what really happened on that planet and again in Young's head, between Young head-butting Rush and leaping through the Stargate back to Destiny at the last second, is never revealed as a scene to the viewer nor spoken about in detail later by Young. Did he plan to kill or maroon Rush, or did he just want to have it out with the biggest douche in outer space immediately and in private? With Rush unconscious and the time to return to the Stargate extremely short, did Young leave Rush because he wanted to be rid of him or because trying to carry Rush back would have almost certainly resulted in both of them being stranded? Having to piece this together for oneself using future behavior as a guide, being able to come to either conclusion reasonably, and in general having morally ambiguous characters who weren't straight-up sociopaths or evil weirdos was one of the things that set this show apart from anything else on TV at the time. I feel like SGU did a really good job in not explaining Young's thinking too much. My opinion is that he decided on the spur of the moment to strand Rush. It was in a fit of rage, and he felt guilty about it a few hours later. By then, it seemed like it was too late. Still, that's my impression and not explained too openly. I also like how there's still a lot of distrust going forward, which doesn't make things too easy for the characters. Man, do you summarize things rather in a long but succinct manner.. I am growing more and more into these "Musings" of yours.. Great job once again.. Thanks again, David. It's been a lot of fun to revisit the show slowly and think about each episode. It's different than the normal re-watch.